With thirty-three events across five continents under its belt in 2017 alone, including an eight-week debut residency at Privilege Ibiza, ULTRA’s world-renowned RESISTANCE concept returns to Miami bigger and better than ever before, as it announces its mammoth lineup for 2018. Having significantly upgraded and expanded its presence across Bayfront Park last year, RESISTANCE will once again dominate two colossal areas of ULTRA’s waterfront home, as it continues to grow into its own festival within a festival. In addition to welcoming back Arcadia Spectacular’s jaw-dropping ‘Spider’ for the third consecutive year, RESISTANCE’s global ambassador Carl Cox will again host the Megastructure on Friday, March 23 and Saturday, March 24 to ring in the festival’s landmark twentieth birthday. As expected The Megastructure will welcome back some of the biggest names in house and techno across the first two days of the festival, with headline sets form Carl Cox (on both days), Adam Beyer, Jamie Jones, Joseph Capriati, Josh Wink, Nastia and a special b2b2b performance from Dubfire, Nicole Moudaber & Paco Osuna and a debut performance from Pan-Pot. More names are due to be announced across both arenas in the coming weeks. 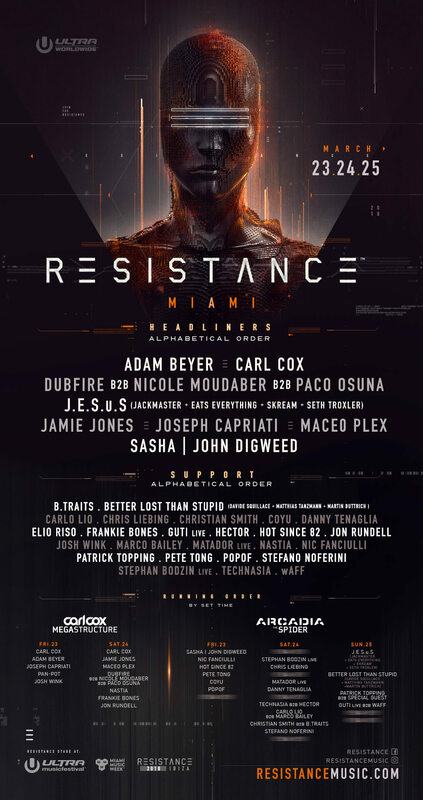 RESISTANCE takes place at Ultra Music Festival which is an 18+ event during Miami Music Week on March 23, 24 and 25, 2018. General Admission and VIP tickets are currently on sale at ultramusicfestival.com priced at $379.95 and $1,499.95 respectively, but the festival is 90% sold out so act now before it’s too late. Early Bird and Payment Plan tickets have now sold out. For further details and ticket information, head to ultramusicfestival.com. For more information on all RESISTANCE events, visit resistancemusic.com.